The letter K inspired twenty-two appetizing Indian flavors! Let's start with two rich, delicious and nutritious K unvegetables, one is a fruit and the other, a nut...Khajoor or dates, and Kaju or cashew nuts. These two natural goodies come together in a beautiful sweet treat called Khajoor Kaju Laddu made by Sreelu of Sreelu's Tasty Travels. Then, we have a fungus masquerading as a vegetable, Kumbh or mushroom. Wild mushrooms are used in some select parts of India, and cultivated mushrooms have just become popular and readily available in the last decade or so. Even so, Indian cuisine has taken to mushrooms eagerly and we have tons of recipe for cooking them Indian-style. Here, Vani of Spiced... shares an easy way to use mushrooms and all the vegetables you have on hand to quickly create a satisfying Kumbh Pulao. Next, we have a flower, or rather, a part of a flower, imitating a vegetable: the lotus root, known in Hindi as Kamal Kakri. Trust Linda of Out Of The Garden to use this gorgeous root to make a delicious creation...she dips slices of the kamal kakri into batter and fries it into an unusual snack: Kamal Kakri Pakoras. The next word is a bean rather than a vegetable, Kale chane, translating into "black garbanzo". These are a variety of chickpeas that are smaller and darker than the garbanzo beans that are commonly used. Richa of As Dear As Salt cooks these tiny beans into a delicious tomato-onion based curry called Rase Wale Kale Chane. Richa of As Dear as Salt combines moong and dahi into the simple yet delicious dish called Khattu Mag. This is a Gujarati favorite, Khattu in Gujarati means tangy. Musical of Musical's Kitchen uses jimikand (a type of Punjabi tubers) and cooks them with a tangy sauce to make Khatte Jimikand, which she then serves with some spicy puris. Next comes a gorgeous, festive curry, the Korma. A popular restaurant-style dish as well as one made at home for special occasions, kormas are made using many different recipes in different parts of India. Latha of Masala Magic makes her version of Korma with tons of vegetables delicately laced with a cashew-cream sauce . The first is a version from Sharmi of Neivedyam, who makes a Punjabi Kadi that features golden spinach dumplings swimming in a tangy yogurt sauce, restaurant style. Another version of kadhi with dumplings comes from Prajakta of Swaypakghar. She makes a Maharashtrian version with little lentil balls that are cooked in yogurt sauce to make these delicious Kadhi Gole. Next comes an easy, made-in-minutes version of Spinach Kadhi by Tee of Bhaatukli. This is her debut post! Welcome to the food blog world, Tee. Traditionally, Kadhi is paired with a rice-and-lentils medley called Khichdi. The mere thought of eating a bowl of khichdi-kadhi is enough to put most Indians in a good mood, and it is certainly my all time favorite comfort food. Here, Coffee of My Khazana Of Recipes presents a beautiful step-by-step guide to creating a heart-warming meal of Khichdi and Kadhi right in your own home. Apart from the K ingredients and dishes, an indispensable tool in the Indian kitchen is also a K word: the Indian-style wok, called a Kadhai. The kadhai is very useful for so many different kinds of preparations: frying, stir-frying and much more. Indeed, a particular kind of North-Indian stir-fry (highly popular in restaurants) is named after the kadhai! Swapna of Swad shares a delicious recipe for Kadhai Vegetables, a medley of vegetables in a gorgeous spicy curry. Kunjulli is Malayalam (language of Kerala) for "shallots". Reena of Spices of Kerala introduces the shallot as the "unsung hero of many of the scrumptious Kerala dishes" and makes a flavorful, traditional curry of eggs with shallots or Kunjulli Mutta. Kovakkai is Tamil for "ivy gourd" (tendli/ tindora). Sheela of Delectable Victuals uses this tender green vegetable to make her favorite dish, Kovakkai Paruppusili, by sauteeing the ivy gourd with steamed lentils. Kothimbir is Marathi (language of Maharashtra) for "cilantro". Anjali of Anna Parabrahma mixes a liberal amount of cilantro with chickpea flour to make a steamed cake that is sliced and fried into some golden, savory Kothimbir Vadi. Kudamilagai is Tamil for "green pepper". Ranjani of Eat and Talk cooks this ever-popular and easily-available vegetable into a delicious stir-fry called Kudamilagai Poriyal. Kobbarikaya is Telugu (language of Andhra Pradesh) for "coconut". Shivapriya of My Cookbook makes a medley of the "sweet coconut and sour mango" to create a tasty chutney called Kobbarikaya Mamidikaya Pachadi. Kariveppilai is Tamil for "curry leaves". Revathi of En Ulagam talks about the curry leaf as "n often forgotten ingredient but nevertheless filled with micro-nutrients" and goes on to make a spicy Curry leaves powder that can be mixed with steamed rice for an instant tasty lunch. Kakdi is Marathi (and also Hindi, although the two words are pronounced slightly differently) for "cucumber". Mahek of Mahek's Kitchen makes a breakfast dish with cucumber that is popular in Goa, a rich and sweet pancakes redolent with cardamom, called Kakdiche Bhakri. Bee and Jai of Jugalbandi make a Tamil dish called Kootu, literally translating as "combination". Their version of Kootu is a nutritious medley of toor dal and red chard, sprinkled with a crunchy topping of pumpkin seeds. Asha of Aroma/Foodie's Hope makes a Gujarati dish called Khandvi, which is just about a work of art: batter ladled onto a flat surface, then rolled into a savory delight. Asha presents a step-by-step guide to making tasty home-made Khandvi. Suma of Veggie Platter makes a dish from Karnataka called Kosumbari. With cool cucumber, soaked moong dal and a sprinkling of herbs and lemon juice, Suma's version of Kosumbari looks like the perfect snack for the hot summer months ahead. 1. Grate the raw mangoes, put them in bowl, then add the sliced onion to it. 3. In a saucepan, heat the oil. Temper the oil with the mustard seeds and the pinch of asafoetida. Add the haldi pwd and let it cool. 4. After it has cooled, add it to the above mixture. Mix it properly and the pickle is ready. Dairy foods play an important role in Indian cuisine. Dahi (Indian-style yogurt) and ghee (clarified butter) are part of almost any Indian meal. Another milk-derivative that is a prominent part of Northern Indian cuisine is paneer, the only cheese that is indigenous to India. Paneer is easily prepared at home without the use of enzymes like rennet, using souring agents like lime juice to "split" milk (biochemically, to make the milk proteins insoluble and precipitate them by lowering the pH of the milk) and by collecting the resultant solids (mostly the milk protein casein) and pressing them down into cheese cakes. Paneer, with its mild, milky and pleasant taste, is well-liked by most people. Paneer does not melt on being heated, instead it can fried to give it a golden crunchy crust. With its general appeal, paneer in its various forms is used in many many dishes in Indian cuisine, from curries to desserts. In curries, it is an easy way to add some additional protein to a vegetable-based dish. 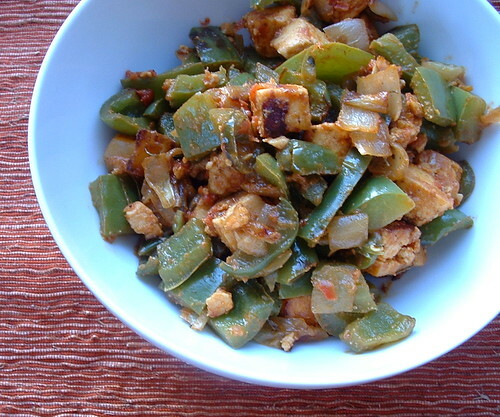 Often, vegetarian versions of meat curries will substitute fried paneer cubes for the meat. Can tofu be used as a substitute for paneer in Indian dishes? My answer would be, yes and no. Yes, in many cases, you can make the substitution with great results. No, tofu tastes quite different from paneer so you should not expect the results to be identical. I often make a compromise: I save real paneer for special occasions and use tofu for weeknight dinners in place of paneer. If you really manage to squeeze the water out of tofu and then bake/ shallow fry the cubes, it will absorb the sauces better. For lovers of paneer, a vegetable-paneer curry may often be much more appealing than the vegetable curry alone. Adding paneer is an easy way to make a dish more festive. In this series, I certainly wanted to make one dish with vegetables and paneer, and of the dozens that are out there, I chose one from my favorite food categories, street food! 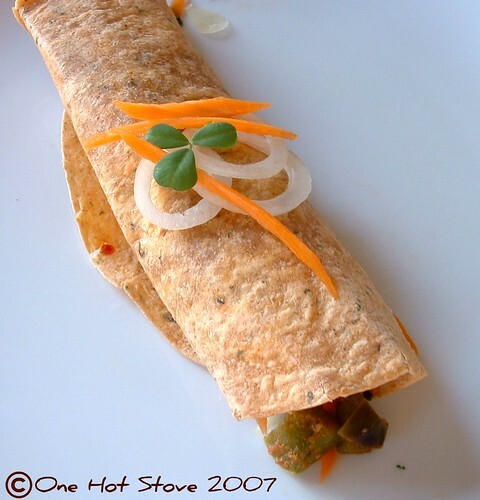 Kati rolls are a creation that takes on different avatars in different parts of India. "Kati" translates as stick, and the idea is just to take a roti or flatbread, stuff it with one of many tasty stuffings, and roll it up into a cigar-shape that makes for easy eating on the run. In NYC, I got hooked onto these kati rolls at the Kati Roll Company in Midtown Manhattan. This also happens to be a reader-request dish. A reader, Prajakta D., who also lives in Missouri, mailed me some weeks ago asking for a recipe for kati roll. Here it is! 1. Make the filling: Chop 1 large onion and 1 large green pepper into big cubes. Heat 1 tbsp oil in a skillet. On high heat, saute the onion and pepper until slightly browned and blistered. Add 1/2 tsp ginger-garlic paste, 1 tsp red chili powder, 1/2 tsp turmeric and salt to taste. Stir in 1 packet (about a cup or two) paneer cubes (thawed). Stir-fry on medium-high heat. Add 1 tsp kasuri methi and 1 chopped tomato (fresh or canned) and stir-fry for a few more minutes. Turn off the heat and stir in 1 tsp chaat masala. 2. 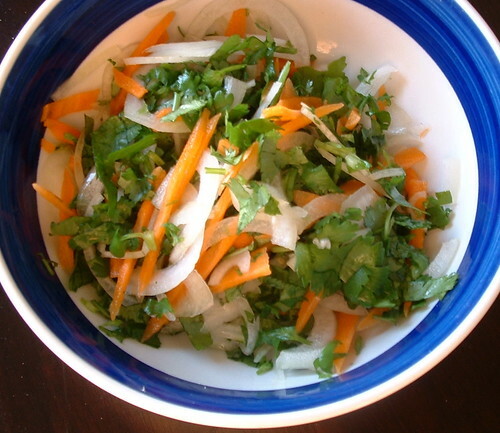 Make the salad: Slice a small onion very thinly (I used a mandoline). Cut 1 carrot into thin slivers. I find the taste of raw onion too sharp sometimes, so I marinated this salad for 5-10 minutes with 1 tsp lemon juice and a sprinkle of salt to "cook" the onion a little bit (ceviche-style). Then, add some herbs. I used 2 tbsp minced cilantro and 2 tbsp minced methi or fenugreek leaves (home-grown!). You can add some mint too. 4. Roll it up, and it's a wrap! Kati rolls are designed to be extremely tasty, and every bite should be a flavor explosion, so if you find that your kati roll tastes too tame, sprinkle additional lemon juice, chaat masala, chili powder or all three until it tastes right. 1. Make a mint-cilantro chutney and smear it on the roti before filling it. 2. Make a version with potato: using cubes of boiled potato instead of the paneer. 3. Make an egg version by using a spicy omelet as a filling. 1. Eat it as a snack in the evening, or serve it as part of a chaat party. 2. Pack it in a lunch box or on a picnic. 3. Cut each roll into little pieces and serve as a tasty appetizer. I love seeing what people are coming up with every week, and I'm learning a lot about Indian cooking too. Great post as always. I love your weekly event! Like jai and bee say... I am always thinking..whats this week in my kitchen for Nupur's event. this is so fantatic , one hot stove is "hot' ! thanks for making it so lively and picturesque ! Great K round up! Look at these delicious dishes and an Indian buritto as well. Hi Nupur, your home-grown methi looks *beautiful*!! Ta daa, indeed!! Yours grew much more lush and green than mine. It's gorgeous!! those methi shoots look precious. congratualtions on your gardening success. and that kathi roll is so elegant, as usual. 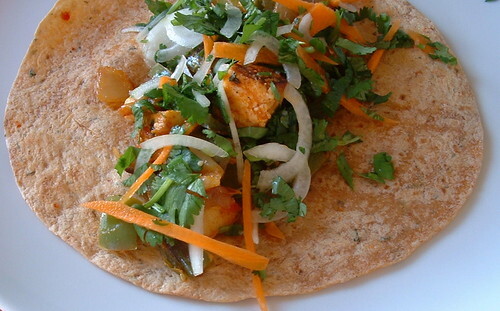 Lovely write-up Nupur and yummy looking kati roll, bookmarked i'm going to try it :). Hey Nupur, thanks for the amazing round up. And the kathi roll,dear.....that brought back many fond memories of NYC. Kathi Rolls and Indian Bread Company were two of my favorite eat-outs :). Prompt neat round up. Thanks so much for the initiative. Home grown Methi!! looks really nice! I wish I had a green thumb!! 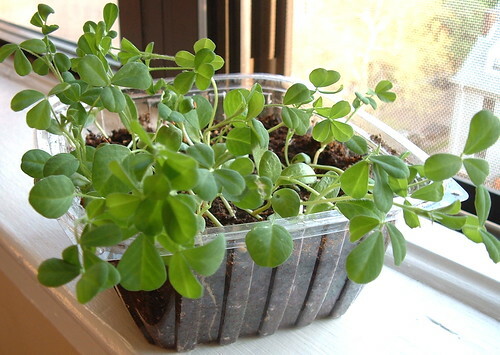 Your methi plant looks lovely. Would it be possible for you to do a small post on how to grow it? Latha, thanks for being a regular participant! Glad you like the kati rolls. Anon, thanks for the great ideas. Asha, thanks for stopping by! Linda, it is just this tiny pot, the smallest methi patch in the world :) I hope to see yours soon! Maybe you will do a post for the GBP event?? Shivapriya, let me know if you try it! Musical, love those two restaurants! I've been trying to replicate that stuff ever since. Manasi, I said I was going to be busy and unable to post during the week! Not the weekend! Sorry you misunderstood. I'll be glad to include your entry if you want to send it in. Did not mean to get you upset. Once again, a new treat to me. Reading your blog is like reading a wonderful cooking encyclopedia. So many new ideas and new ingredients to discover! Thank you. very yummy dishes:) Thanx for hosting this very different & informative event. Nice round up. Sorry, I have not been able to participate. Busy with a few things at home. Thanks for the fun round up. and thanks for the Fun round up. Hi Nupur, you always do such an amazing round up, week after week! Your Kati roll looks great, all the pictures are wonderful! Sorry I missed K too, had so many ideas for a change, but never got around to doing it :(. nupur, greatt round up. you are so prompt and made reading very interesting. good going with your gardening:). 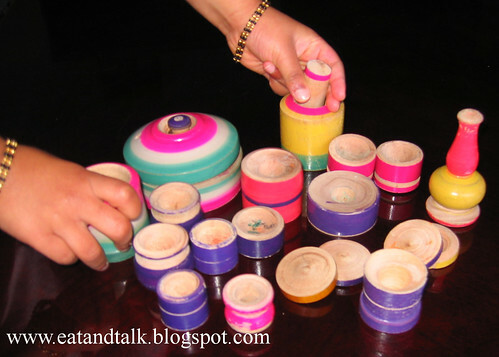 Nupur thanks for the round up! Its fun reading all the tongue twisters with K.
I learnt about so many new dishes too. I feel so privileged having participated in it. Great post. Your pics look so beautiful. I have a question. If you pack those roti rools for lunch, don't they get soggy? Aaawww, sorry I misunderstood! No hard feelings,I hope!! I will post my recipes anyway, & I am gonna be in time for L..!! Jimikand is not a "punjabi tuber" It is available all over India, you might know it as "suran." In any case, the linked page uses sweet potatoes and not jimikand. Ranjani, glad you like it! Lakshmi, thanks for stopping by! Vani, let me know if you try it. 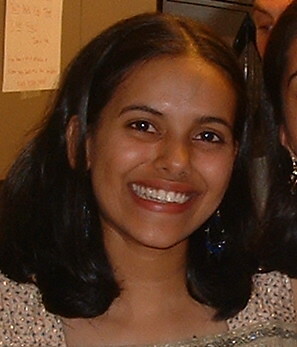 Sharmi, I feel privileged that you participated! Suma, the filling is dry enough that sogginess should not be a problem. If you are worried, pack the salad in the small separate dabba. Manasi, there is always next week ;) and the week after that ;) and so on! :) No, no why would there be hard feelings? Khaoo, what a nit-picky comment! Let me try and address all your concerns: I meant that jimikhand is the Punjabi name for the tubers. The linked page already explains that it is the common name for suran and sweet potatoes. I was trying to highlight "khatta" as a distinct category (there were two entries with that term) and that is how the khattu mag got into the first set. The distinction is very subjective and just intended to bring some order (and hopefully make it more fun to read) to a list of otherwise diverse and heterogenous dishes. Give me a break, will ya? wow! Awesome!! Heaven!!! I don't have words to describe my feelings on eating this kathi roll. Thanks for such a fantastic recipe. I am going to stock a week's supply of kathi rolls in our fridge. Shailesh, I'm so delighted that you enjoyed it! Thanks so much for taking the time to leave the feedback :) I appreciate it! I made kathi rolls for dinner yesterday and they were a hit with me and hubby. I used mix of your and Tarla Dalal's recipe. The use of tortilla was a very very good idea, I too had whole wheat tortilla in fridge which tasted real god with the paneer stuffing. I heated them on tava till they were (just) little crisp.. Please have a look at Tarla Dalal's recipe for Paneer Tikka Kathi roll (available free on her website, I got it in my google search), its "almost" the same as your recipe, with slight differences like marinating panner and tomatoes in curd mixed with all the spices and little besan. I think it makes panner stuffing more chatpata.. Thanks for the recipe (as always). Happy blogging (abt food and general stuff that you write too). Made this.. It came out so well.. Thanx for a lovely recipe..